During this class students will complete three beginning level book sewing structures. Tacketing is simplest example dating from the 3rd and 4th century. In French sewing on linen tapes, the sections of the textblock are linked together by passing the the thread under the stitch of the preceding section. Catch stitch on linen tapes starts as an all along stitching. Please register online. October is here! And with it comes the grand State Fair of Texas, haunted houses, and new opportunities for learning and creating. Online registration is now available! October 29th 3:30pm-6pm - Pumpkin Decorating for All! October 30th 10am-11:30am - Clay for Adults! Lizzy Wetzel taught our first felting class this past Saturday. Students were introduced to the history and process of flat felting. Felt is the oldest textile known to man, and has been created for centuries all over the world for use as clothing, shelter, rugs, and art. Our four part workshop series explores the traditions and process of felting from dying wool rovings to using felt to draw and build. Students learn to create both decorative and functional objects. Students interested in gaining a deeper understanding of this versatile art material should consider registering for the full series. Please register online. We had two children's classes this week. We studied Mexican folk art, analogous colors and neighbors. Friday evening was spent experimenting with bottle cutting. Kim tried out heating the bottle with a flame. Thanks to our students Kim, Bruce, Clint, Victoria, and Mary! Our bicycle basket class was a great success. Jan taught a full house. Each student wove a complete basket. Sweet! Thanks to our super students! Thanks to everyone who braved the heat and joined us for our opeing this Sunday. Beautiful bandannas and corn husk dolls were make by all. 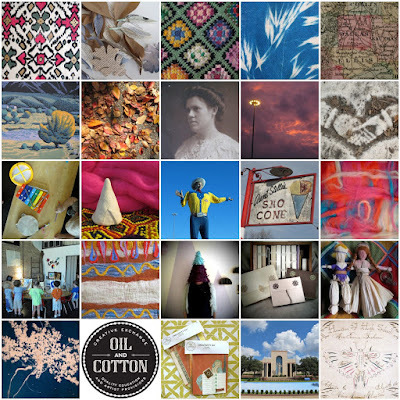 To learn more and register for fall classes and workshops please visit oilandcotton.com. We are very pleased to announce the opening of Oil and Cotton in Oak Cliff, Texas. 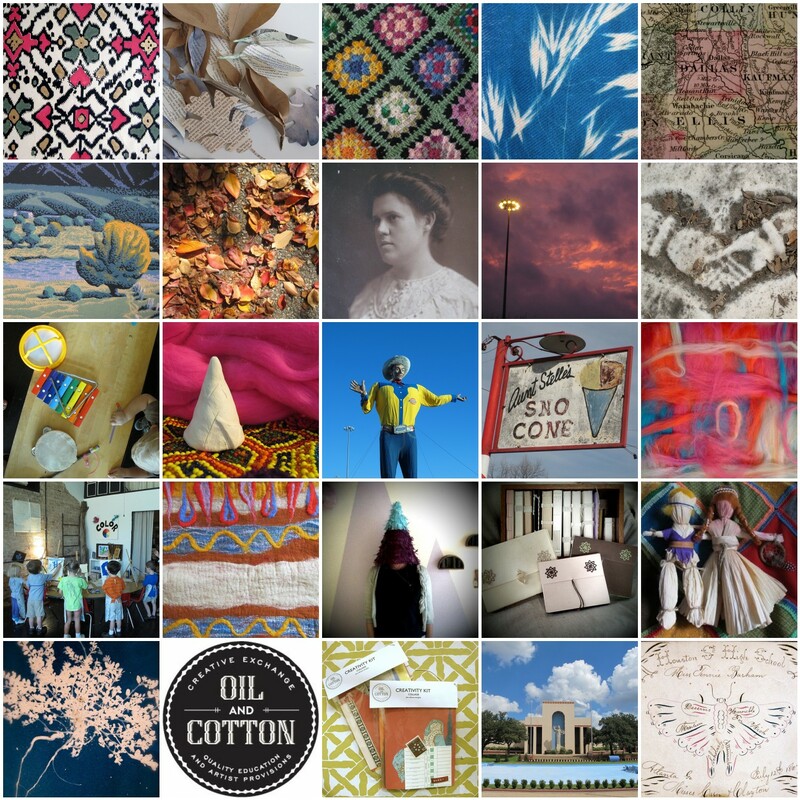 Oil and Cotton Creative Exchange of Dallas is the collaborative project of Kayli House Cusick, Shannon Driscoll, their friends, family and community. We are a creative commons for students of all ages. The heart of our class programming is the intersection of academic art, the tradition of handcraft and human ingenuity. We will have a variety of classes and welcome adults – from hobbyists to creative professionals, teens – preparing an art portfolio or just being creative with friends, children – art lovers and mess makers alike, and families who like to make art together. We will all be there, so you can meet our teachers, peruse the retail counter, learn about our classes, and relax in our space that love built! 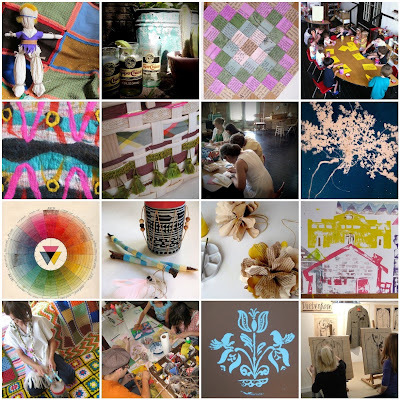 Our Fall 2010 schedule of classes is full of opportunities to learn and create. Here is just a peek at the workshops offered in September. Attached you will also find a calendar of our Fall 2010 weekly class schedule (creative arts classes for ages 18 months to adults). If you would like to register for workshops or classes, please email us at oilandcotton@gmail.com. This year we are building and fine-tuning and as we grow. Let us know if you have questions or suggestions, we would love to hear from you.